I love beets. Of course, I was well into adulthood before sticking a fork in one and merely just liking it. But now that I only eat small, flavor packed beets that are grown locally, and which are truly superior to large and conventionally grown beets, it's true love. Today, I roasted just a few uber nutritious beets ---many consider beets a tonic for the blood -- from Chubby Bunny Farm. Wrapped in foil and placed on the middle rack of a toaster oven at 425 degrees they were cooked through in about 40 minutes. In the meantime, I de-membraned the grapefruit so only the juicy fruit remained and prepared a mustard vinaigrette with 2 T olive oil, the juice of a lemon and 1T of grainy mustard. 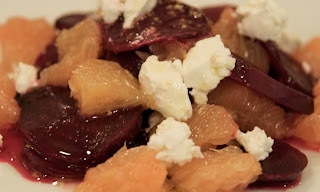 When the beets were cooked through -- check by piercing them with a fork -- and cool to the touch, I peeled and sliced them into 1/8 inch slices then layered them with the grapefruit using an equal amount of grapefruit and beets and sprinkled a taste of crumbled and local Coach brand goat cheese on top before spooning on the salad dressing. I didn't use all of the dressing so as not to overwhelm the deliciousness of the beet, grapefruit and cheese combination, and to keep the dish light. A refreshing summer salad to kick off a summer, locavore meal.